Contrary to Earth, our Moon has no active volcanoes, and the traces of its past volcanic activity date from billions of years ago. This is surprising, because recent Moonquake data suggest that there is plenty of liquid magma deep within the Moon because part of the rocks residing there are thought to be molten. Scientists have now identified a likely reason for this peaceful surface life: the hot, molten rock in the Moon's deep interior could be so dense that it is simply too heavy to rise to the surface like a bubble in water. For their experiments, the scientists produced microscopic copies of moon rock collected by the Apollo missions and melted them at the extremely high pressures and temperatures found inside the Moon. They then measured their densities with powerful X-rays. The results are published in Nature Geosciences on February 19, 2012. The team was led by Mirjam van Kan Parker and Wim van Westrenen from VU University Amsterdam and comprised scientists from the Universities of Paris 6/CNRS, Lyon 1/CNRS, Edinburgh, and the European Synchrotron Radiation Facility (ESRF) in Grenoble. Five decades after the Apollo missions, the formation and geological history of the Moon still hold many secrets. 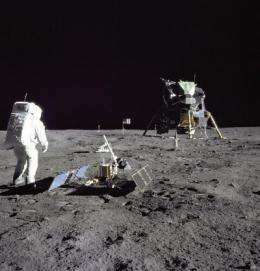 The astronauts not only returned 380 kg of Moon rocks to Earth but also placed many scientific instruments on the lunar surface. Last year, NASA scientists published a new model for the make-up of the interior of the Moon, using Moonquake data from these Apollo-era seismometers. 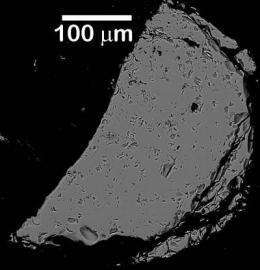 Renee Weber and her colleagues claim that the deepest parts of the lunar mantle, bordering on the small metallic core, are partially molten, by up to 30 per cent. In the Earth, such bodies of magma tend to move towards the surface leading to volcanic eruptions. If the deep interior of the Moon contains so much magma, why don't we see spectacular volcanic eruptions at its surface? The driving force for vertical movement of magma is the density difference between the magma and the surrounding solid material, making the liquid magma move slowly upwards like a bubble. The lighter the liquid magma is, the more violent the upward movement will be. To determine the density of lunar magma, Wim van Westrenen and his colleagues synthesized moon rock in their laboratory in Amsterdam, using the composition derived from Apollo samples as their "recipe". The pressures and temperatures close to the core of the Moon are more than 45,000 bar and about 1500 degrees. It is possible to generate these extreme conditions with small samples, heating them with a high electric current while squashing them in a press. 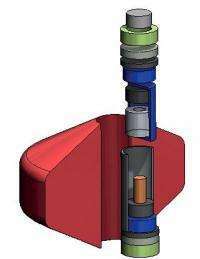 By measuring the attenuation of a powerful synchrotron X-ray beam at the ESRF traversing the sample both solid and molten, the density at high pressure and high temperature could be measured. 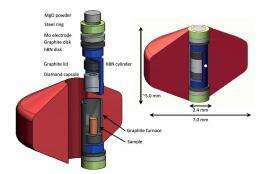 "We had to use the most brilliant X-ray beam in the world for this experiment because the magma sample is so tiny and confined in a massive, highly absorbing container. Without a bright beam of X-rays, you cannot measure these density variations", says Mohamed Mezouar from the ESRF. The measurements at the ESRF were combined with computer simulations to calculate the magma density at any location in the Moon. Nearly all the lunar magmas were found to be less dense than their solid surroundings, similar to the situation on Earth. There is one important exception: small droplets of titanium-rich glass first found in Apollo 14 mission samples produce liquid magma as dense as the rocks found in the deepest parts of the lunar mantle today. This magma would not move towards the surface. Such titanium-rich magma can only be formed by melting titanium rich solid rocks. Previous experiments have shown that such rocks were formed soon after the formation of the Moon at shallow levels, close to the surface. How did they get deep into the mantle? The scientists conclude that large vertical movements must have occurred early in the history of the Moon, during which titanium-rich rocks descended from near the surface all the way to the core-mantle boundary. "After descending, magma formed from these near-surface rocks, very rich in titanium, and accumulated at the bottom of the mantle  a bit like an upside-down volcano. Today, the Moon is still cooling down, as are the melts in its interior. In the distant future, the cooler and therefore solidifying melt will change in composition, likely making it less dense than its surroundings. This lighter magma could make its way again up to the surface forming an active volcano on the Moon  what a sight that would be!  but for the time being, this is just a hypothesis to stimulate more experiments", concludes Wim van Westrenen. How can someone even write a headline like that with a straight face? To determine the density of lunar magma, Wim van Westrenen and his colleagues synthesized moon rock in their laboratory in Amsterdam, using the composition derived from Apollo samples as their "recipe". When it comes to pressure specifically, since density is a factor, there seems to be some circular reasoning involved. The study may be 100% correct, but the writeup doesn't inspire confidence in that being the case.